Roots Ethiopia will transform the current Special Education classroom at The Haile Bubamo School in Hosanna, Ethiopia. In response to several conversations with school leaders, the classrooms will receive audiovisual aids, new furniture, toys, educational cards, writing materials, hygiene materials and sporting equipment. A bright coat of paint and much needed repairs to the roof and door of this classroom will also be included. A parent awareness training will be conducted to encourage families to send their children with special needs children to school. Rural communities in Ethiopia often believe that disabilities, especially cognitive disabilities, are caused by evil spirits or are the result of a curse from God. This can prevent families from advocating for the care and education of their children. 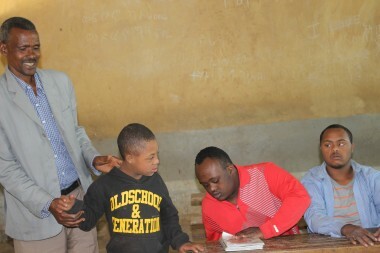 The Ethiopian Government and community leaders are trying to include children with special needs in the greater community, but progress is very slow and it takes time to change attitudes and beliefs. How Did Roots Ethiopia Get Involved? We heard about the Special Education classroom during our 2014 field visit and were intrigued. This past October, we visited the classroom which is the first and only government school in Hadiya zone that has a program for children with cognitive disabilities. On the day of our visit, three of the registered twelve students were there to greet us. Of course, there are many, many more children in this region with cognitive disabilities, but they are often kept out of school. Our Program Director told us that the school was very interested in improving conditions for the children in this classroom. We were ready to listen and now we are responding.